Somebody Say Something: Crazy Pineapple! Ever sat through a meeting and something just wasn’t right? Or maybe you work in an office each day in a situation that is just a little too prickly? Everyone is looking at the giant pineapple in the middle of the table but no one is saying anything about it? Or, more obviously, someone is way out of line, but no one dares talk about it, much less say, “whoooa, whatchutalkinbout, you’re scaring the juice outta me?” Then you wind up feeling like maybe it’s just you, maybe you are just the crazy giant pineapple and everyone else had it going on? Listen up, here is a plea for everyone to call a pineapple a pineapple! Speak up. Ok…if you’re not willing to speak up, will you at least please tell ME if I’m ever acting crazy? I really want to know. Give me a little eye signal or perhaps work in the word “pineapple” into the discussion. That way I’ll know to do a personal-crazy-check-in. I’ll do the same for you. If we all promise to do this for each other, we’ll weed those stray pineapples right out pretty soon, I betcha. Ha! 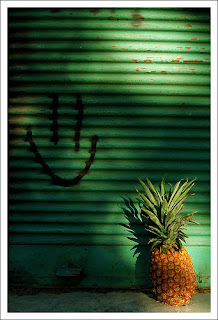 I have finally read the famous pineapple blog. I must say that if ever I encounter another pineappl situation, I will be better prepared. Funny enough, I really like pineapple juice. Hmmm, what does that say about moi? be able to identify a problem and create a quality repair.